The St. Charles bicycle patrol unit is an "as needed" unit that was started in May of 1993 with the help of the staff from the Bike Rack here in St. Charles. 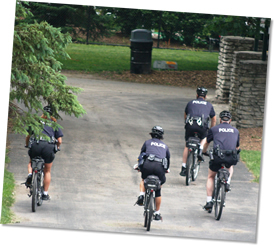 The bicycle patrol is used to supplement the three patrol shifts during the summer months. They are directed by the shift supervisor as to what areas in the city to patrol. In the past, you may have seen them working at the festivals, assisting with crowd control, finding lost parents, and maneuvering through the crowds to assist citizens. The bike patrol unit is used mostly at night, when the quiet stealth of the bikes is used to catch criminals in the parks and neighborhoods under the cover of darkness. There are currently 18 officers trained in the use of the bicycle as a patrol tool and six specially outfitted mountain bicycles. Training consists of correct operation of the bicycle, speed drills, negotiating stairs, completing an obstacle course, maintenance, and remembering the "rules of the road."